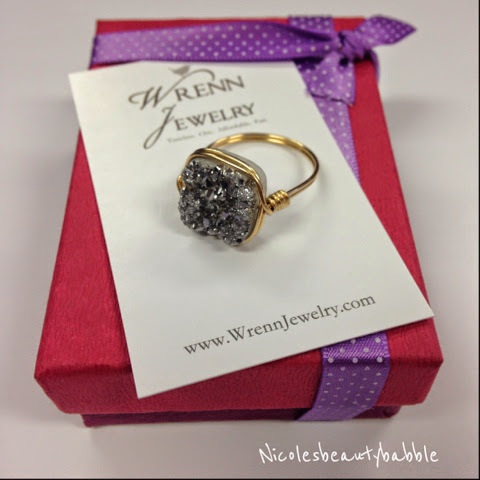 The company I purchased this stunning piece from is called Wrenn Jewely and they are located in the US but ship to Australia with great postage rates. 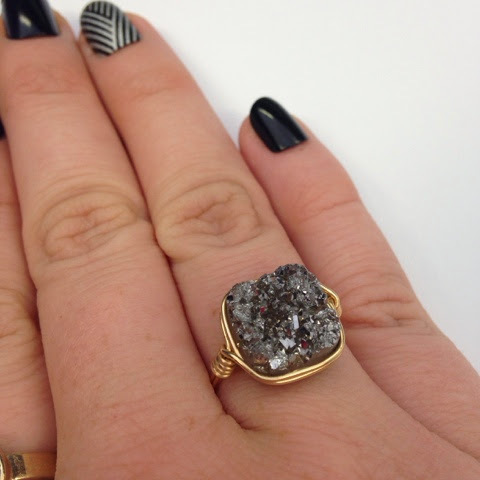 This ring is called the druzy ring and they have some other fantastic pieces that I have on my list to get. It is made from a natural stone with either 14k Gold filled, Stirling Silver or Rose Gold filled wire. The quality is fantastic and they are very durable while looking dainty and a stunning statement piece. You can choose what wire you would like and also the ring size while ordering. My order arrived in about a week and a half, packaged beautifully as you can see from the first picture. Since I have received this little gem I have not taken it off. I have been wearing this ring non stop for the last few months and can tell you that the quality is fantastic I opted for the Gold and it has not tarnished or turned my finger green even when worn in water. I highly recommend this company if you enjoy unique and good quality jewellery. You can check out the beautiful range of handmade jewellery here, This ring was $32.00 + postage. Do you have any great websites for unique jewellery?